I recently had the opportunity to visit Hamburg on a training programme, ‘Democracy Camp 2017’. Migrant and refugee activists from across Europe came together to learn from American migrant movement builders. Together, we explored how we can change the negative narrative of migration, and how we can organise and build a movement across Europe, to challenge the rising tide of far right movements. It wasn’t a coincidence that Hamburg was chosen to host the training; the city of Hamburg has re-settled the second largest number of Syrian refugees in Germany. The training was opened by Katharina Fegebank, Vice-Mayor of Hamburg and a member of the German Green Party, who spoke so differently from any politician I have ever known. Her message was simple: Hamburg is open to refugees. At the height of the refugee crisis, Hamburg was receiving 500-600 refugees per day. The citizens of Hamburg pulled together, volunteering to build shelters and provide language classes. 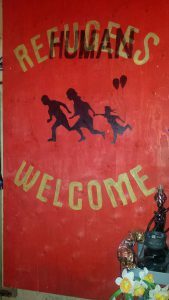 We were encouraged to visit the Kampnagel, an arts and performance space, where Hamburg’s support for refugees is announced at the entrance with a florescent ‘Refugees Welcome’ sign. Out the back of the Kampnagel is the Migrantpolitan, a small wooden shed. 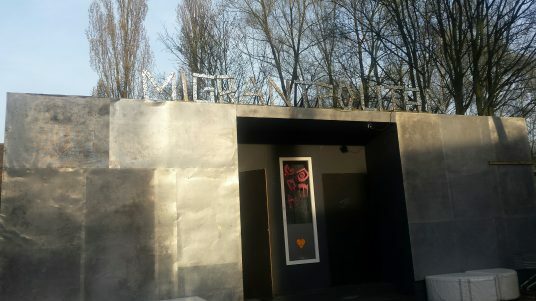 The Migrantpolitan is a small art space and café run by refugees with donations from the public. This space is like a community centre for many of the young Syrian refugees, who hang out there and take part in lots of creative projects. I went to visit the Migrantpolitan on a Friday evening. Art work, paintings, craft and cultural fabric covers the walls, and there is a really homely feeling about the place. I found some young Syrian refugees sitting in worn out donated sofas, drinking Mate (a herbal tea) and chatting away. I was welcomed to their group and given tea. We talked about the usual things young people like to talk about – music and fashion. Our conversation led to swapping stories of being a refugee and some of the challenges that face us. Many of them shared with me the frustration they felt at leaving their dreams behind. They would have never imagined being in the situation that they face now, being refugees in a foreign country. They told me the refugee camps do not feel safe, especially for young women like them, and they come regularly to the Migrantpolitan to escape. This little shed provides a safe space for them, where they can be themselves and not a ‘refugee’. On the far corner of the wall there is a ‘refugees welcome’ poster, but at the Migrantpolitan they have scrubbed out the word ‘refugees ’and replaced it with ‘humans’. As one of them explained to me: ‘We are not refugees, we are human beings – so it should just say humans welcome’. I went back to the Migrantpolitan again on my last evening in Hamburg, this time with some of my new friends from the Democracy Camp course. Unexpectedly, we ended up running an African dance workshop for them, and they taught us some Syrian dances. We connected on a human level, beyond our label of being a refugee or a migrant.